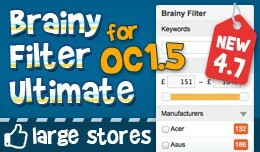 Brainy Filter SEO plugin is an add-on for Brainy Filter for search engine optimization. 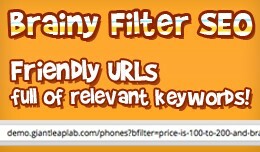 It allows managing the way Brainy Filter generates URLs. You can make the URLs prettier with more relevant keywords for search engines. Features for Manag..
Brainy Filter looks beautifully and works on different devices. There is a high-grade HTML/CSS code that is easy to adapt to any custom design. The filter has been tested on Android, iOS, and Windows Phone devices. The filter works with responsi..
Brainy Fil­ter for Open­Cart is a well thought out and excel­lently made mod­ule that allows fil­ter­ing prod­ucts by keywords, brands, prices, avail­abil­ity, rating, options and prod­uct attrib­utes. 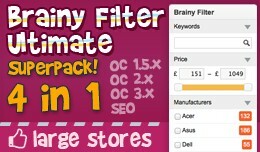 Brainy Filter looks beautifu..
Brainy Fil­ter for Open­Cart is a well thought out and excel­lently made mod­ule that allows fil­ter­ing prod­ucts by keywords, brands, prices, avail­abil­ity, rating, options, and prod­uct attrib­utes. 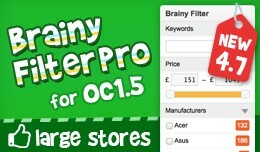 Brainy Filter works on diff..
Brainy Fil­ter for Open­Cart is a well thought out and excel­lently made mod­ule that allows fil­ter­ing prod­ucts by keywords, brands, prices, avail­abil­ity, rating, options, and prod­uct attrib­utes. 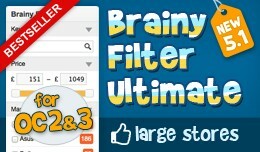 Brainy Filter looks beautif..
Brainy Filter Ultimate Superpack includes: Brainy Filter Ultimate for OpenCart 2.x & 3.x Brainy Filter Ultimate for OpenCart 1.5.5-1.5.6 Brainy Filter SEO add-on to Brainy Filter for OpenCart 2 (supports Brainy Filter versions starting fr..
Brainy Filter Ultimate Superpack / OC1-3, SEO Pl..